If you want to solve your clutter and mess problem, look no further. 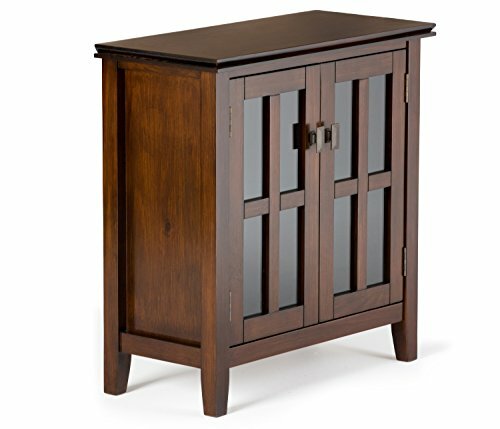 We designed the sleek and compact Artisan Low Storage Cabinet as the answer to your storage needs. Two glass doors open to two adjustable shelves allowing you to reconfigure the layout to suit your needs. Display your fine china or decorative accents on dedicated display space for a clean, distinctive look. This item is hand-crafted and hand-finished with utmost care, as such variations and imperfections should be expected and should be welcomed as the natural beauty of the wood. This item is hand-crafted and hand-finished with utmost care, as such variations and imperfections should be expected and should be welcomed as the natural beauty of the wood. Style includes clean angle edged top, square, slightly tapered legs and rectangular Antique Bronze knobs. If you have any questions about this product by Simpli Home, contact us by completing and submitting the form below. If you are looking for a specif part number, please include it with your message.